I could swear that when Allora first opened in East Sacramento last year, I checked the menu and didn’t see anything vegan. Recently, however, I was reading the free Inside newspaper that’s delivered to my mailbox each month, and I found an article about the mother of the chef/owner. She had moved to Sacramento at her son’s request to care for the restaurant’s garden, and the article mentioned that she ate a mostly vegan diet. I figured that if his mom was mostly vegan, the chef must have added some plant-based items to the menu, so I checked again. Sure enough, there are several dishes for vegans at Allora. I had dinner there with my husband Phil last night, and asked for the vegan menu. It lists vegetarian and vegan items, but the vegan dishes are specifically indicated. 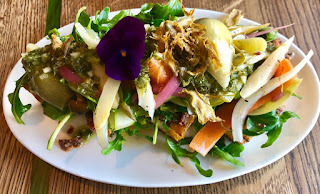 I began with grilled focaccia, which is spread with olive tapenade and then topped with a mix of local vegetables, including arugula, asparagus, carrot ribbons, mushrooms, pickled onions, and artichoke hearts. It was very good, and I especially enjoyed the olive tapenade. For my entrée, I had a tough time choosing between the bucatini and the mushroom risotto, but finally opted for the pasta. 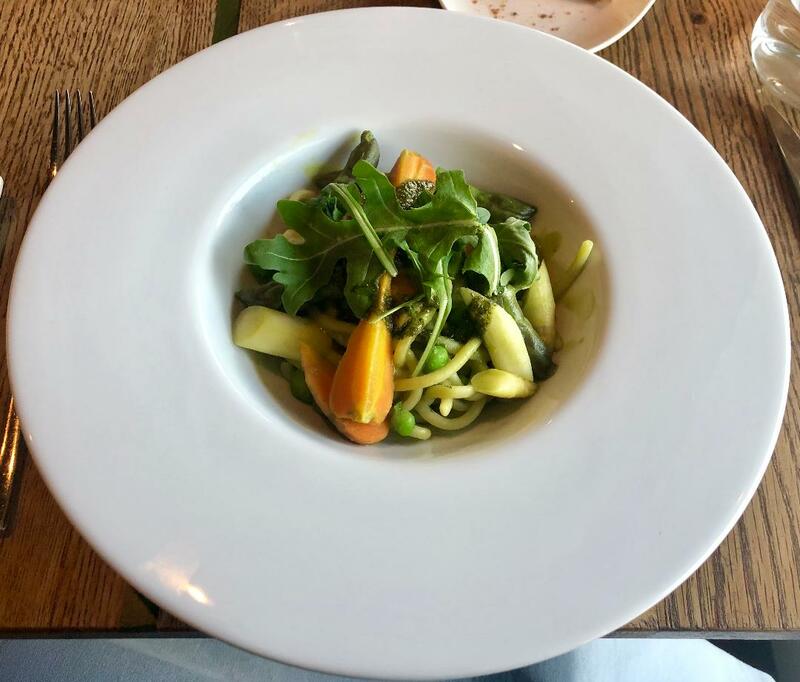 The bucatini was tossed with a pea and tarragon pesto, carrots, and asparagus, then topped with a few arugula leaves. I thought it was the perfect spring dish. Allora is a very stylish and well-appointed restaurant that would be perfect for date night or a special occasion. You should definitely check it out! Allora is located at 5215 Folsom Boulevard, and their phone number is 916-538-6434. Their website address is https://allorasacramento.com/, and their Facebook page can be found at https://www.facebook.com/allorasacramento/. The restaurant serves dinner only, and is open Sunday through Thursday from 5:00 p.m. to 9:00 p.m., and Friday and Saturday from 5:00 p.m. to 10:00 p.m. I think one of the best things about the new plant-based burgers that are showing up in restaurants these days is that they've made it easier for restaurants that don't usually cater to vegans to offer something we can eat after all. Impossible Burgers are popping up everywhere, and even some fast food restaurants are getting into the act. Carl's Jr. recently began offering a Beyond Burger, which they are promoting heavily in television commercials. 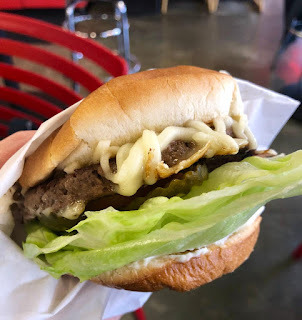 In checking the Impossible Foods website the other day to see which Sacramento restaurants are serving Impossible "meat," I was interested to see that Suzie Burger now offers an Impossible Burger. Back when 33rd Street Bistro and Wildwood Kitchen, which are owned by the same people who own Suzie Burger, first began serving the Impossible Burger, I sent a message to Suzie Burger asking if they had plans to do the same. At the time, they did not because the product was too expensive for their menu. But they're offering it now! 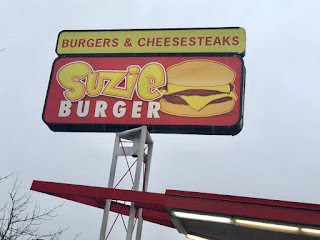 I stopped by Suzie Burger with my husband Phil for lunch the other day. The Impossible Burger doesn't show up on the restaurant's online menu or on the menu posted behind the counter. But it's advertised on a sign by the cash register, shown with nonvegan items like thousand island dressing and what appears to be cheddar or American cheese. But if you tell them you want it vegan-style, they'll substitute vegan mayo and get this -- vegan cheese -- for the nonvegan items. I gave it a try and it was excellent! Most restaurants in town that do serve the Impossible Burger don't take the extra step of offering vegan cheese, so it was a real treat to have that option. I also like the fact that Suzie Burger is basically a fast food restaurant, so I can pick up my burger and be eating in the comfort of my own home a few minutes later. Suzie Burger is located at 2820 P Street, and their phone number is 916-455-3500. The website address is https://www.suzieburger.com/, and their Facebook page can be found at https://www.facebook.com/suzieburgersac/?epa=SEARCH_BOX. 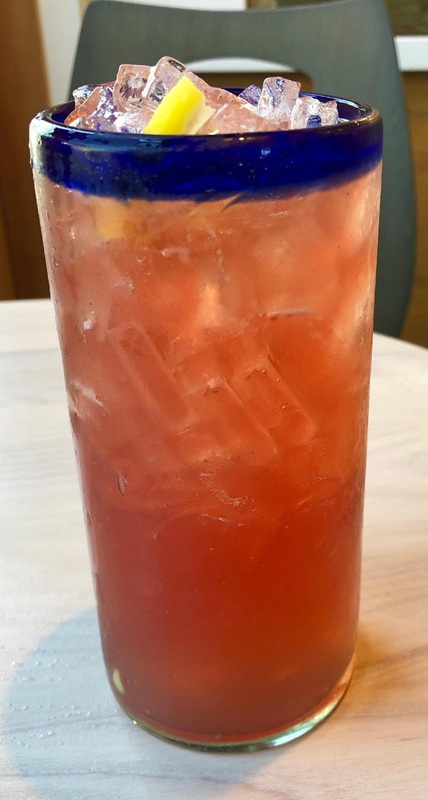 The restaurant is open Sunday through Tuesday from 8:00 a.m. to 9:00 p.m., and Wednesday through Saturday from 8:00 a.m. to 10:00 p.m.
La Venadita has been serving Mexican food in the Oak Park neighborhood for a few years now. Until recently, though, I'd never been there because their menu didn't appear to be very vegan-friendly. That has changed, however, with the addition of an Impossible meat option to a couple of the restaurant's menu items. I was at La Venadita yesterday for lunch with my husband Phil. 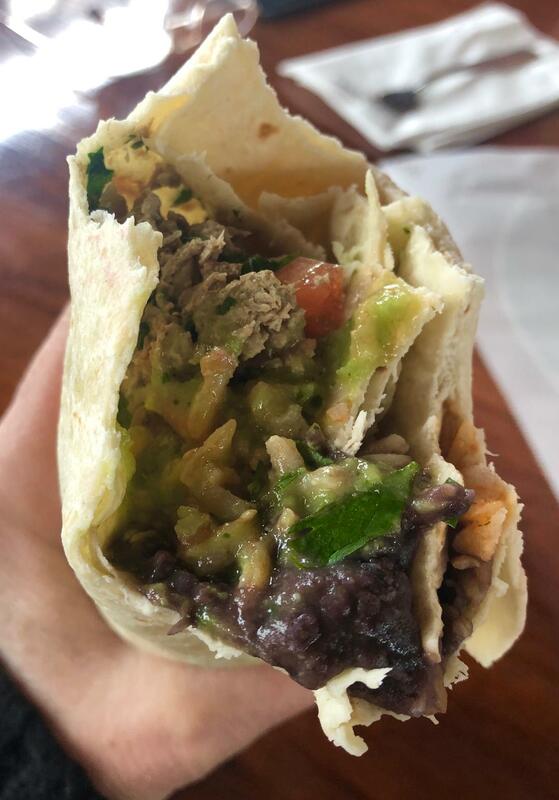 I thought about getting the Impossible tacos, but since I was really hungry, I opted for a burrito. It was filled with Impossible meat, black beans, rice, tomatoes, avocado salsa, and cilantro, and I made sure to have them omit the cheese. It was really good, and I will happily go back to La Venadita in the future. 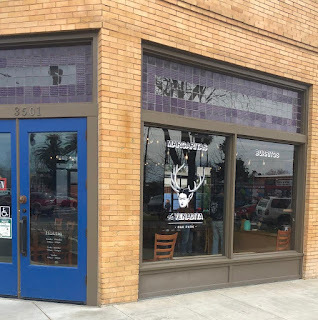 La Venadita is located at 3501 Third Avenue, and their phone number is 916-400-4676. Their website address is http://www.lavenaditasac.com/, and their Facebook page can be found at https://www.facebook.com/lavenaditasac/. 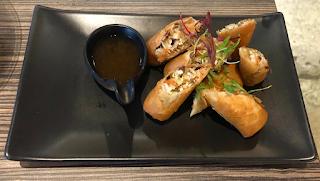 The restaurant is open Tuesday, Wednesday, Thursday, and Saturday from 9:00 a.m. to 9:00 p.m., Friday from 9:00 a.m. to 10:00 p.m., and Sunday from 9:00 a.m. to 3:00 p.m.
A new restaurant opened in East Sacramento recently. The House of Authentic Ingredients has the convenient acronym of T H A I, which is the type of cuisine served there. My friend Deborah and I had lunch at T H A I earlier this week. I was happy to see several vegan or veganizable items on the menu. 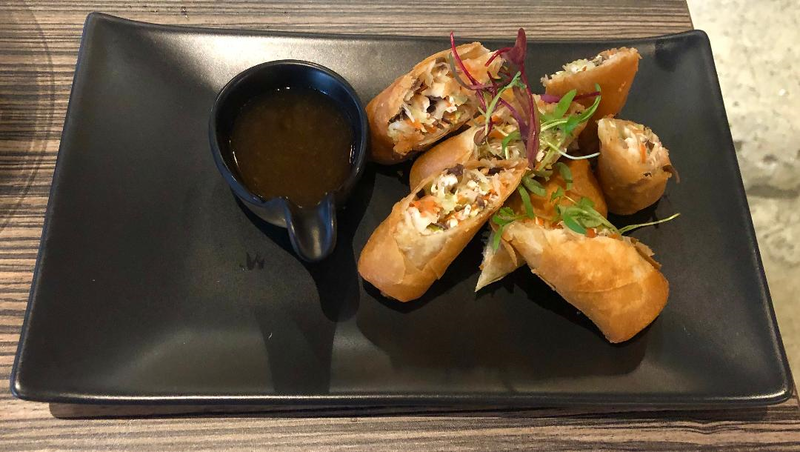 Since I have a weakness for fried food, I started with an appetizer of paupia, crispy spring rolls served with sweet and sour sauce. Those tasty little rolls were a great start to my meal. I wanted a noodle dish for my entrée, so I ordered the pad kee mao, wide rice noodles stir-fried with bell pepper, green beans, onions, kaffir leaf, basil, Thai chili, and my choice of protein -- tofu, of course. It was delicious. The menu has a (V) next to many items, but I think that basically means the item can be made vegan, not that it's necessarily vegan already. To be on the safe side, you should let your server know that you are vegan and don't want any non-vegan ingredients in your food. T H A I is located at 4701 H Street, and their phone number is 916-942-9008. Their website address is http://www.thaiatsac.com, and their Facebook page can be found at https://www.facebook.com/thaiatsac/. The restaurant is open Sunday through Thursday from 11:00 a.m. to 9:30 p.m., and Friday and Saturday from 11:00 a.m. to 11:00 p.m. I don't know how I missed hearing about the opening of Westside, the new café by Identity Coffees, a couple of months ago. But as soon as I saw a picture of their vegan waffle on an Instagram post by Conscious Creamery, I was there. 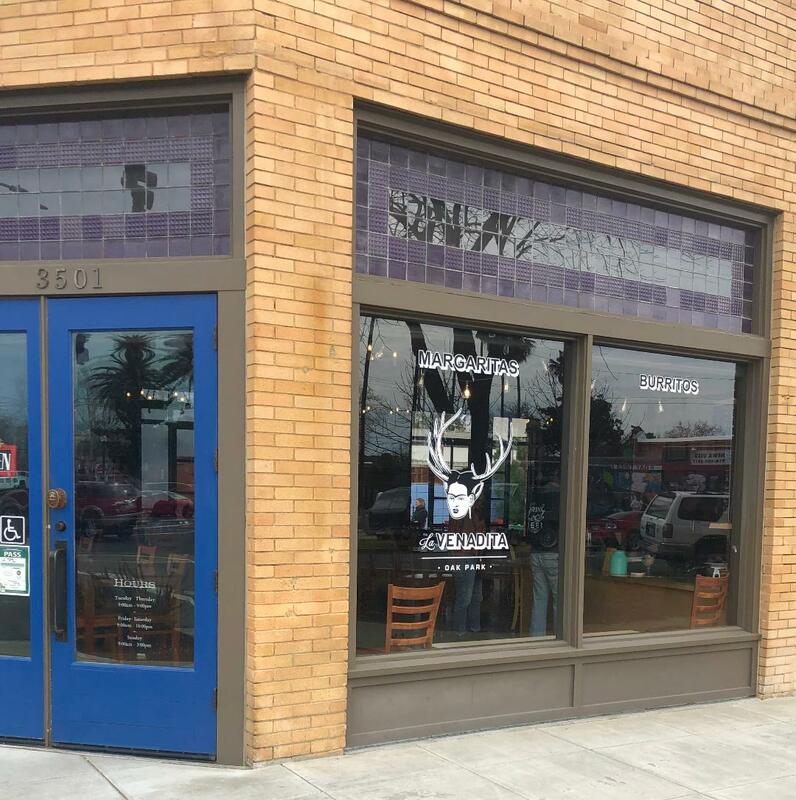 Westside is a bright and spacious coffee house in West Sacramento. They serve breakfast items, sandwiches, salads, and bagels, in addition to coffee, tea, beer, wine, and other assorted drinks. And did I mention they have vegan waffles? I'm sure you can guess what I ordered when I stopped by today. Their waffle batter is vegan, but you'll need to ask for vegan butter. Other vegan toppings include maple syrup or strawberry preserves. 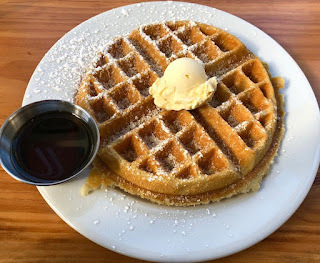 I don't remember the last time I'd had a waffle, and this one was every bit as good as I had hoped it would be. 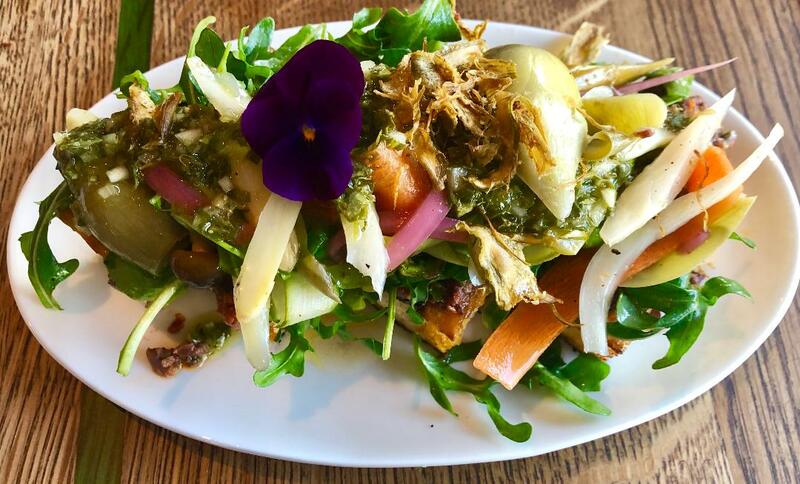 The menu at Westside clearly marks the items that are vegan or can be made vegan, including avocado toast, bagel and spread, hummus bagel, and mixed green salad. They have a sandwich on the menu called "The Herbivore," that looks like it should be vegan, but isn't marked as such. I asked the woman at the counter, however, and she confirmed that it is vegan. Westside is located at 289 Third Street in West Sacramento, and their phone number is 916-465-0272. They don't appear to have their own webpage yet, but their Facebook page can be found at https://www.facebook.com/identitycoffeesswestside/. Westside is open daily from 6:00 a.m. to 7:00 p.m. When the B Street Theatre opened at its new location, the Sofia, a new café was included in the complex. Tea Bar & Fusion Café has quickly become a midtown favorite, offering bowls, wraps, toasts, and lots of different tea-based beverages. I stopped in for lunch today to see what they had in the way of vegan options. I was happy to see both grilled ginger tofu and fireroast veggies on the list of choices for their bowls and wraps. I decided to try a bowl, which included my choice of topping (grilled ginger tofu), grain, salad, or combo (I chose the quinoa rice blend), and dressing. The menu doesn't say which dressings are vegan, but the man at the counter checked his binder and told me my dressing options were wasabi ginger or oil and vinegar. I opted for the wasabi ginger. 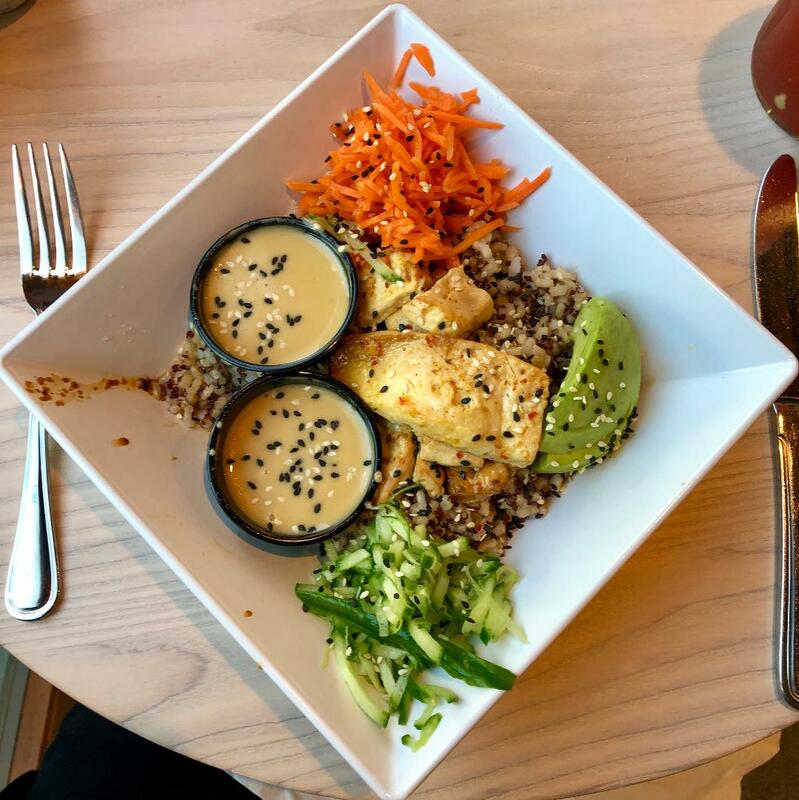 The bowls also include avocado, cucumber, carrots, and sesame seeds. This was a very satisfying meal, with the wasabi ginger dressing giving it just the extra little kick it needed. Be cautious when you order at Tea Bar, however, and if you're not sure whether something is vegan or not, ask. Some items that seem like they should be vegan, such as the avocado or hummus toast, are not. There were so many drinks I wanted to try, but I finally chose the pomegranate lemonade. It was excellent. Tea Bar & Fusion Café is located at 2700 Capitol Avenue, and the phone number is 916-444-8227. Their website address is http://ilovetbar.com/, and their Facebook page can be found at https://www.facebook.com/ILoveTBar/. The café is open Monday through Saturday from 10:00 a.m. to 10:00 p.m., and Sunday from 11:00 a.m. to 9:00 p.m.